This thread shows how to use Sherpa to create the source spectrum required as input to the two available Chandra PSF simulators, MARX and the Chandra Ray Tracer, ChaRT. One of the spectral specifications needed to run a MARX or ChaRT simulation is an unconvolved spectrum file, i.e., one containing the definition of the source spectrum at the entrance aperture of the HRMA for which a PSF should be simulated. This thread steps through an example Sherpa script which can be used to create such a spectrum for input to MARX or ChaRT. MARX and ChaRT are separate PSF simulators, but note the use of ChaRT requires MARX as a second step; the ChaRT output must be projected onto the detector plane with MARX; see the ChaRT threads for details. MARX provides a detailed ray-trace simulation of how Chandra responds to a variety of astrophysical sources and can generate standard FITS event files and images as output. It contains detailed models for Chandra's High Resolution Mirror Assembly (HRMA), the HETG and LETG gratings, and all the focal plane detectors. ChaRT traces a collection of rays through the definitive Chandra X-ray optics model which are then projected onto the detector separately via MARX. The spectrum input to MARX must be in units of energy (keV) versus photon flux density (photons/cm2/s/keV), and the input to ChaRT must be in units of energy (keV) versus photon flux (photons/cm2/s). Model source spectra in Sherpa are automatically output in the required units for both interfaces, using the appropriate model command for each; and those created with the ChaRT routines contributed to Sherpa may also be used as input to ChaRT, as shown in the section "Plotting and Saving the Spectrum." fits the chosen source model to the data. Note that the Sherpa fake_pha functionality is available for simulating a source spectrum independent of an actual data set; see the Sherpa simulation threads for details. In order to plot and save the best-fit source model spectrum to be input to ChaRT, use the functions plot_chart_spectrum and save_chart_spectrum, available in the chart_spectrum contributed Sherpa package. For MARX, the Sherpa plot_source, get_source_plot, and save_arrays commands should be used. 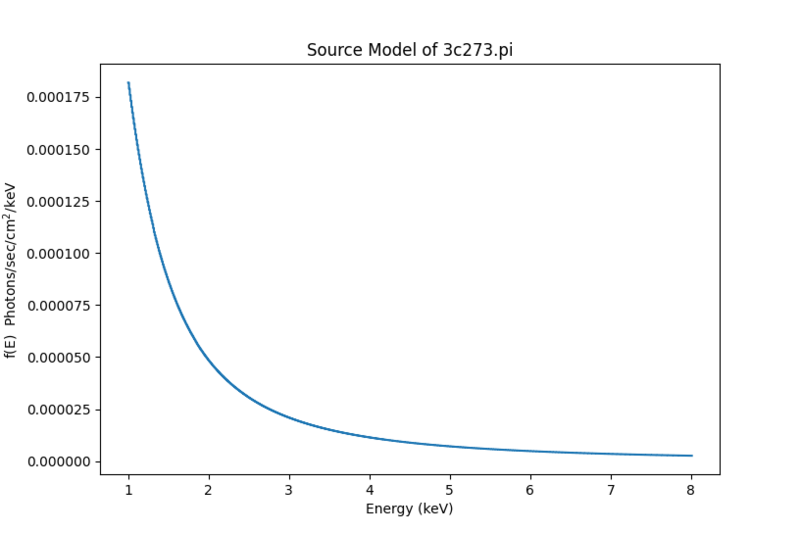 The source model is plotted in flux units of photons cm-2 s-1 versus energy in keV, as required by ChaRT. The save_chart_spectrum command is used to create the output spectrum file to be input to ChaRT. In this example, we use the optional elow and ehigh arguments to restrict the output to the 1-8 keV range. If the bounds are omitted, the full energy range as determined by Sherpa is used. 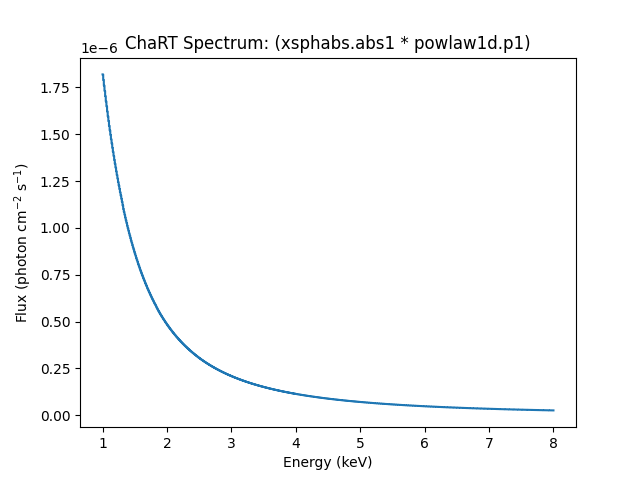 The output produced by save_chart_spectrum is an ASCII file that contains three columns: the first two columns must be the lower and upper energy boundaries, in keV, and the third column is the photon flux in units of photon/cm2/sec; the values in the flux column must be >0. Since the MARX software requires the input spectrum to be in photon flux density units (photons/s/cm2/keV), we use the Sherpa plot_source function and associated get_source_plot to view and access the spectral data arrays, since these functions automatically output the unconvolved spectrum in the required units. Figure 2 shows the resulting unconvolved model plot in the 1.0-8.0 keV energy range. The source model is plotted in flux density units of photons cm-2 s-1 keV-1 versus energy in keV, as required by MARX. The spectrum may be written to an ASCII file using the Sherpa save_arrays command, where the input x- and y- data arrays to be written to the file are taken from the plot of the spectrum we just created with the plot_source command. This is done by retrieving the energy and photon flux density arrays from the output of the get_source_plot command. Due to a bug in get_source_plot, the lo and hi arguments in the function cannot be used, and the entire energy grid defined by the ARF/RMF is used for the spectrum. The ASCII file written by the above save_arrays command lists the energy upper-bin edge in keV in the first column, and the flux density in photons cm-2 s-1 keV-1 in the second column. Note that the MARX format for an input spectrum uses the upper-bin edge for energy and that the flux density in the first row may be any value, as the entry is not used. The CXC is committed to helping Sherpa users transition to new syntax as smoothly as possible. If you have existing Sherpa 3.4 scripts or save files, submit them to us via the CXC Helpdesk and we will provide the CIAO/Sherpa 4.10 syntax to you. You are ready to run a MARX simulation once you have created a spectrum input file like example file source_flux_chart.dat, and have chosen an exposure time for the PSF simulation. 09 Dec 2015 reviewed for CIAO 4.8, updated to create input spectrum for ChaRT v2. 25 Jan 2016 updated to make use of fixed sherpa_contrib.chart Python module. 22 Nov 2016 reviewed for CIAO 4.9; note bug in get_source_plot which shows the entire source model energy grid, even when an energy range argument is applied to the function.